The First Colony Foundation, a North Carolina 501(c)(3) non-profit organization formed in 2004, is dedicated to conducting archaeological and historical research, combined with public education and interpretation, relating to the story of America’s beginnings with the attempts by Sir Walter Raleigh to establish English colonies at Roanoke Island in the 1580s under his charter from Queen Elizabeth I.
Nick Luccketti, Bly Straube, and Eric Klingelhofer of First Colony Foundation confer with Pamunkey Indian archaeologist Jeff Brown (l to r) on Fort Raleigh set of 2008 filming of PBS Time Team America episode. In 2012, following an inquiry from FCF, British Museum curators discovered on Sir Walter Raleigh’s map of coastal North Carolina the hidden image of a Renaissance-style fort at the head of the Albemarle Sound. Since that discovery by the British Museum, our archaeological teams have been working at what is styled ‘Site X,’ the locality indicated on the ‘Virginea Pars’ map of eastern North Carolina and southeastern Virginia as the possible location of a colonial outpost. Evidence continues to mount that this site deserves further investigation. Research so far supports an interpretation that a small number of the Lost Colonists were present for some time on this site in the area concealed on a sixteenth century map made by John White, the colony’s governor and grandfather of Virginia Dare. 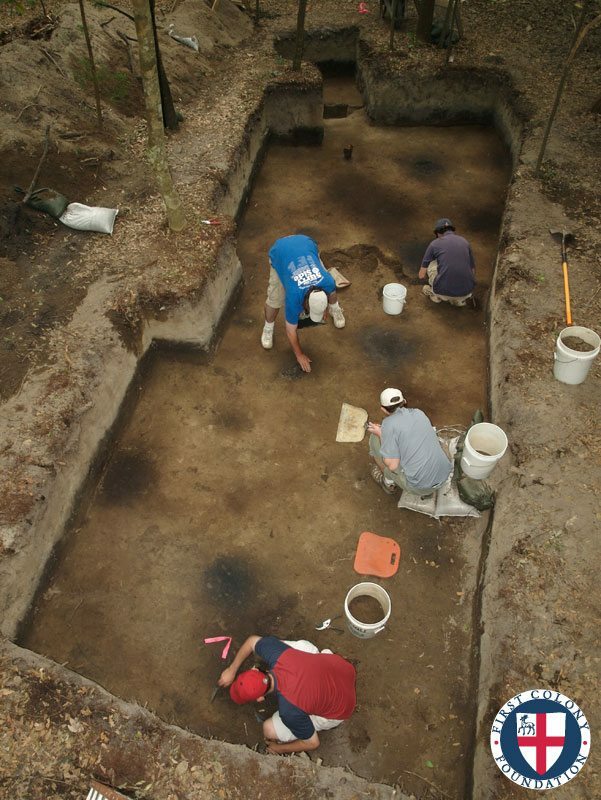 The First Colony Foundation also continues archaeological research at Roanoke Island under an agreement with the National Park Service (NPS) as partners in archaeological and historical research relating to the Roanoke colonies at the Fort Raleigh National Historic Site. Our collaboration has helped the NPS to install a new and highly informative museum plan for its visitor center where FCF research is highlighted. The FCF seeks your support to develop these research and public exhibition programs to a level that can truly have meaningful and lasting impact. The FCF archaeologists and historians need the resources to conduct survey and excavation programs to fully identify, uncover, and protect any surviving archaeological remains. Excavations conducted near the Hariot Nature Trail in May 2008.